Rick Bayless has published nine cookbooks since 1987's Authentic Mexican. I've cooked out of all of them, and I've not once come across a bunk recipe. So naturally I'm going to include his latest, More Mexican Everyday (Norton), with the others in our ongoing roundup of local cookbooks. A follow-up to 2005's Mexican Everyday, it adheres to the same MO, offering simple recipes with (mostly) easy-to-find ingredients. As with most of Bayless's books, the recipes are ever adaptable. There are a ton for vegetables—four full chapters' worth, with dishes including squash blossom soup, fettuccine with butternut squash and red poblano crema, and yellow mole with grilled fennel. And there are also chapters on breakfast (sample recipe: Xoco's granola) and dessert (e.g., coconut bread pudding) as well as chapters devoted to rice cookers (chipotle rice with shrimp) and slow cookers. I chose a recipe out of the last—mole de olla, or red chile short rib soup—mainly because I'm always disappointed in the insipid version you find in most restaurants. You don't need a slow cooker for this recipe if you're willing to spend a good three hours keeping an eye on a slow braise in a Dutch oven. The short ribs render a ton of fat, so I strained a lot of it off. It's still magnificently rich and deeply beefy. First, know that this "soup pot mole," as the name translates directly from Spanish, isn't a mole in the way we typically think of moles. It's a brothy soup, not a sauce, but one that celebrates dried chile, as do Mexico's most famous moles. Many Mexican cooks will tell you to make your mole de olla with espinazo, the meaty backbone, plus some stewing beef or beef shank. But I suggest using short ribs, knocking off two birds with one stone: the bones provide the richness you'd get from backbone, while the meat adds that incredible beefiness that's brought by beef shank. I believe that every cook should think of this soup as a bowlful of satisfaction rather than the output of an exact list of ingredients. 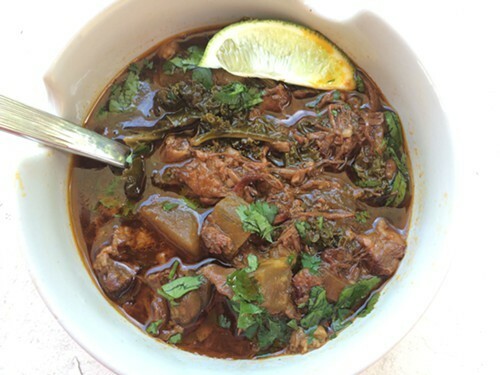 The short ribs provide soul, while the chiles provide spirit. Choose guajillos for lovely bright spiciness, anchos for sweet complexity and pasillas for a rustic depth of flavor that hints at bitter chocolate. (I've called for chile pods here because powder doesn't give enough texture to the broth.) Though I love the combination of chayote, green beans and potatoes in this soup, practically any vegetable is welcome: chayote can be replaced with any summer squash; potatoes can become winter squash or any color sweet potatoes; and the role of green beans can be played by long beans, snap peas, baby artichokes, even a handful of kale or chard. There are two unusual ingredients that are classic in a traditional mole de olla. Folks will be wild about the soup even without them, but if you can find them in your grocery store, or search them out in a Mexican grocery, the experience you'll offer will be truly memorable. Epazote is the jagged-leaf herb that adds its distinctive—I'd say iconic—complexity to the broth as it simmers. And xoconostle is the sour prickly-pear cactus fruit, which is peeled, seeded and chopped into tangy bits to stir into the finished soup. When you're ready to serve, place the green beans in a microwaveable bowl, sprinkle with a little water, cover with plastic wrap, poke a few holes in the top and microwave at 100% for 90 seconds, until just tender. If using the sour prickly-pear fruits, cut them into small pieces: Holding each one with tongs or a towel, cut the ends off, make a slit down the side from end to end, then peel back the thick skin, revealing the nugget of fruit. Cut it in half and, using a small spoon, scoop out the reddish seedpod in the center and discard it. Cut the light-colored flesh into 1/4-inch pieces. Fish the short ribs out of the slow cooker. The meat will fall from the bones: discard the bones and tear the meat into bite-size pieces. If a lot of fat has rendered and collected on the top of the broth in the slow cooker, skim it off. Stir the meat, green beans and prickly-pear cactus, if using, into the soup. Taste and season with salt (usually a generous teaspoon). Ladle into warm, deep bowls and carry to the table. Pass the lime wedges separately for everyone to add al gusto. In a large (6- to 8-quart, at least 12 inches in diameter) heavy pot (preferably a Dutch oven), layer the ingredients as described. Bring to a gentle simmer over medium heat, set the cover in place and braise in a 300-degree oven about 3 hours, adding water occasionally if necessary to ensure that the liquid stays at about the same level. Finish with the coarsely shredded meat, green beans and optional prickly-pear cactus as described in the recipe. I've sketched out a lot of vegetable alternatives in the headnote. 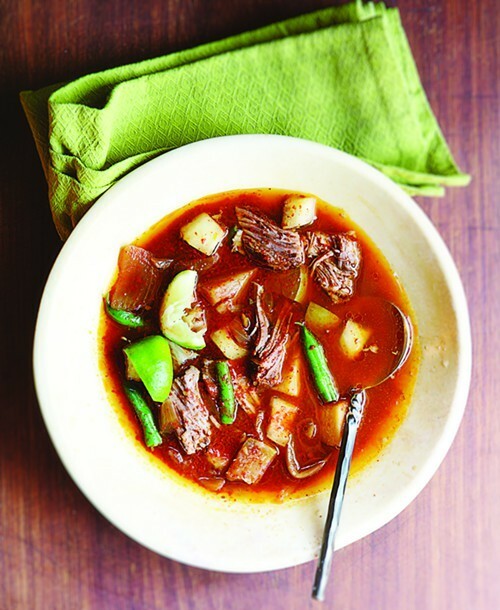 If English-cut short ribs aren't within easy reach, use about 21/2 pounds of cubed boneless stew meat, beef chuck or boneless short ribs plus about 11/2 pounds of soup bones. For the most memorably rich broth, brown the meat in an oil-filmed skillet before starting the soup (some slow cookers have a special setting that allows for browning right in the cooker, while others have a removable insert that can be set directly on the stovetop). New options for spots to drink beer this fall include Corridor Brewing & Provisions, Like Minds Brewery, Band of Bohemia, and Bixi. Cantina 1910's restaurant and farm opens in Andersonville, Modern Mexican conference returns to Kendall, get your tiki mug the honest way, and more. A recipe from the pasty chef's new cookbook Cookie Love. Rick Bayless looks back at how Topolobampo changed Chicago's perception of Mexican food.